What is the defining factor that makes a digital agency a Full Service Digital Agency? In the last few months I’ve found myself involved in several different conversations around this question. While no one seems to know of any overarching authority to attempt to answer this question, everyone without hesitation comes up with the same answer. Strategy. This is a long- and widely-held phenomenon, and though I’m not arguing to make any kind of terminology change, in my mind this mindset ignores the very important area of technology strategy. I got my start in the development side of the industry, and I’ve always worked for very technology-driven organizations. Such organizations may call themselves digital agencies, but they stop short of calling themselves full service digital agencies, simply because they don’t consider strategy to be part of their services. As a technology-driven organization, it is very easy to be pigeonholed into the category of “System Integrator”, which is often seen as the headless implementation arm, executing the strategy laid out by marketing agencies. However, from a technological standpoint, the leaders at these organizations are proficient in thought that can defined as nothing but strategic. I have seen them take charge of multi-vendor relationships, clarify integration points, diagram authentication paths, and execute customer journeys as adeptly as any chief marketer. 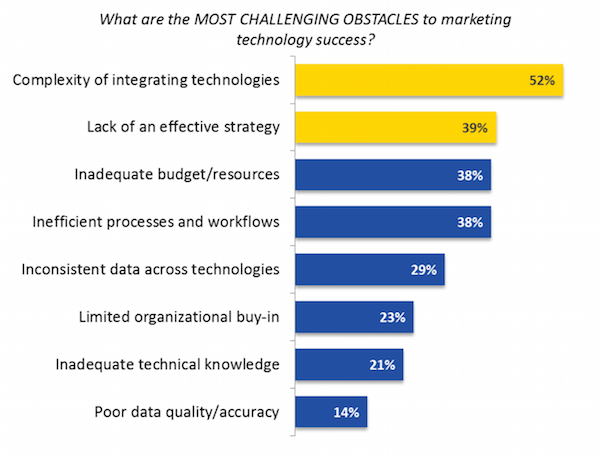 In Scott Brinker's post on chiefmartec.com, he references two different recent studies that list “Integration” at the most challenging obstacle to marketing technology success. "[Integration] can be work, for sure, but when you’ve got someone technical involved – enter stage left the much-beloved character of a marketing technologist – it’s not mysterious." And therein lies the rub. Whether you call it a “marketing technologist”, a “technology strategist”, or a “trusted technology partner”, many a digital marketing effort lacks this skillset. In my experience, the reason that integration ends up so high on the list of challenges is that it has become a victim of many of the other items on the list below it. Issues such as inadequate budget/resources, limited organizational buy-in, and (my own addition) an undervaluing of the technological strategy when compared to the marketing strategy, often lead to the perceived problems in integration. When you have a project that cobbles together a new platform or two with legacy solutions that aren’t on the docket to be replaced yet, or budget solutions that don’t integrate as well as they should, suddenly what should be a simple integration strategy becomes a maze of complexity and frustrating limitations. Some of the most successful ongoing strategic relationships I’ve been a part of have moved the technology partner to the center of the equation, allowing them to manage the strategy around environments, integrations, platforms, and workflows. These stay constant and stable while brand and marketing strategies can shift over time. A stable and efficient technology strategy may even ease the pain of shifting marketing strategies when those changes do take place. I'm certainly not attempting to undermine the importance of an effective marketing strategy. I believe that it is the point of technology to facilitate commerce; otherwise you shouldn’t be investing in it. However, ignoring the strategy that governs the technology that supports your marketing activities can easily kill your marketing or brand strategy, and underestimating the value of a technology partner that can aid you in a successful implementation of those platforms can cause a great deal of unnecessary pain for all but the most technologically adept CMOs. Scott Brinker's “Marketing Technologist” is a good term, but it doesn’t really cover entire organizations. “Strategic Integrator” may be a good option as well, if I may be so bold as to coin a term myself. Whatever you call it, it's become increasingly crucial to have someone in your corner, whether that person is part of your own organization or a trusted partner, to help you navigate all of the technologies, vendors, and integrations necessary to pull together a full-featured and effective marketing strategy. Are you suffering from a lack of strategic integration in your business? Drop me a line, BlueModus just may be able to provide that partnership you've been looking for.